3) The paint contains Imported Ceramic Microspheres which are used by N A S A for making tiles to cover space shuttles for thermal insulation and which are hollow and having vacuum inside. 4) These microspheres reduce the heat generation due to radiation considerably and also help reducing conduction and convection. 5) Being ceramic, they are inert and do not take part in any reaction with paint. 6) These microspheres are dispersed in Epoxy latex paint to achieve the weather resistance, total waterproofing effect and getting the elastomeric effect. 7) Being elastomeric it takes the care of expansion and contraction of the surface on which it is applied. Also after application of this, any conventional waterproofing is not required to the building. 8) Since it is always visible on the top, any damage to it due to drilling, hammering, or chipping can be repaired there only. 9) It is mainly suggested for ROOFS, WALLS, CEILINGS, A/C DUCTS, INDUSTRIAL AND COMMERCIAL SHEDS, SPECIAL APPLICATION IN DEFENSE, COLD STORAGE, AUTOMOBILES, HOMES, BOILERS, FURNACE, FREEZER VANS, OVENS, INSTRUMENTS, STEAM PIPING, PUMPS, TURBINES, VALVES, EXCHANGERS, EXHAUST MANIFOLDS, FLANGES, FILTERS, PLATEN, KILN, RUBBER MOULDS, PRESSES, PLASTIC MOULD and PRESSES to achieve energy saving through blocking heat losses from moulds up to 160 degrees C or any surface needing heat insulation. SPECIALITY: This paint system protects the building and other equipment from all thermal viewers and snipers scopes, air to surface/surface to surface/ GPS/INS aided missiles, thermal targeting systems, satellites and UAVs and advanced scout surveillance systems ,if covered fully. Special application in defence, Walls, Ceilings, A/c ducts, Roofs, Metal Buildings, Homes, Mobile homes, Industrial and Commercial facilities, cold storage, automobiles, and many more. Proper surface preparation, application of sealants at major cracks and proper primers or base coat should be applied prior to application of Ugam ANTI-IR PAINT. 1) An experiment was carried out on a strategically important building and its parking lot. 2) The building was painted with UGAM ANTI-IR paint and the parking lot was not. 3) When seen with thermo graphic imaging camera the building was seen in white who means there is no heat emission. 4) However the uncoated parking lot was seen in orange colour. The parking lot had absorbed heat and was clearly seen in the imager. 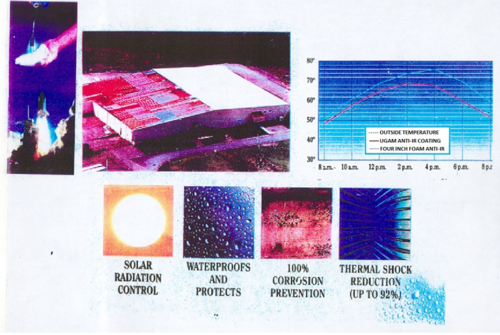 5) Hence it was concluded that this coating is low emissive and can be used to premises from detection from snipers and missiles or any other thermo graphic surveillance system. Supported by our talented professionals, we are offering an exceptional assortment of Exterior Painting Service to our customers. Looking for “Anti IR Paint”?